From my previous post on apples. 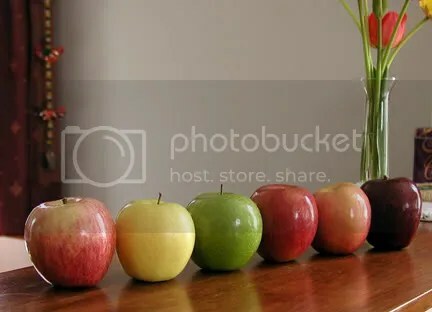 The apples shown were (from left): Royal Gala, Golden Delicious, Granny Smith, Braeburn, Fuji and Red Delicious. As many of you promised, grab a few apples (or any other fruit) on your next outing to the grocery store. They are so much better than the junk snacks the MNCs want us to eat. An Apple (or two) a day!